Yet another Redstone 2 build info leaked online. This time it’s Windows 10 Creators Update build 14997 (14997.1001) for PC and build 10.0.14997.1001 for mobile devices. The build 14997.1001 was compiled on December 28. 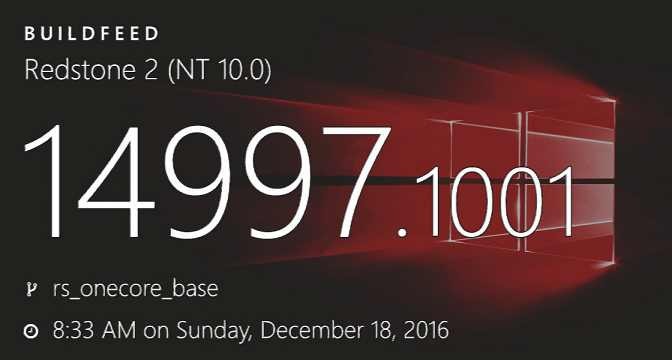 Previously, we reported that Microsoft is now testing Windows 10 Redstone 2 PC build 15000 and mobile build 10.0.15000.1000 internally. The company will release next insider build in January 2017. Meanwhile, Microsoft delivered Windows 10 update kb3213522 build 14393.577 for PC and mobile build 10.0.14393.576. Also, cumulative update KB3206309 build 14986.1001 is now available for Insiders members. If you are facing download and installation issues with the cumulative update, click here for fixes. Windows 10 build 14986 ISOs are now available for download. You can download ISO from here.